In recent years, immigration researchers have increasingly drawn on the concept of social capital and the role of social networks to understand the dynamics of immigrant experiences. How can they help to explain what brings migrants from some countries to others, or why members of different immigrant groups experience widely varying outcomes in their community settings, occupational opportunities, and educational outcomes? This timely book examines the major issues in social capital research, showing how economic and social contexts shape networks in the process of migration, and assesses the strengths and weaknesses of this approach to the study of international migration. By drawing on a broad range of examples from major immigrant groups, the book takes network-based social capital theory out of the realm of abstraction and reveals the insights it offers. Written in a readily comprehensible, jargon-free style, Immigrant Networks and Social Capital is appropriate for undergraduate and graduate classes in international migration, networks, and political and social theory in general. It provides both a theoretical synthesis for professional social scientists and a clear introduction to network approaches to social capital for students, policy-makers, and anyone interested in contemporary social trends and issues. Carl L. Bankston III is an American sociologist and author. He is best known for his work on immigration to the United States, particularly on the adaptation of Vietnamese American immigrants, and for his work on ethnicity, social capital, sociology of religion and the sociology of education. "Provides an important service in presenting in a systematic and clear way the sociological literature on social networks and clarifying the nature of the concept of social capital." 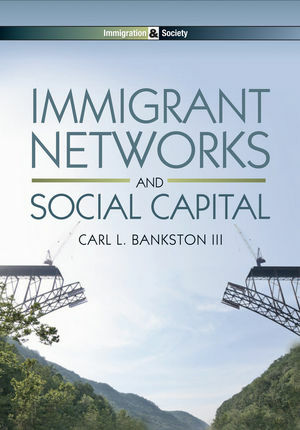 "Carl Bankston offers a comprehensive, clear and compelling view of how social capital and immigrant networks operate and how they relate to pre- and post-migration conditions. Vital for students and scholars of immigration, this book illuminates how workers and other immigrants residing in the United States make their way in a global economy shaped by relationships between individuals and institutions."